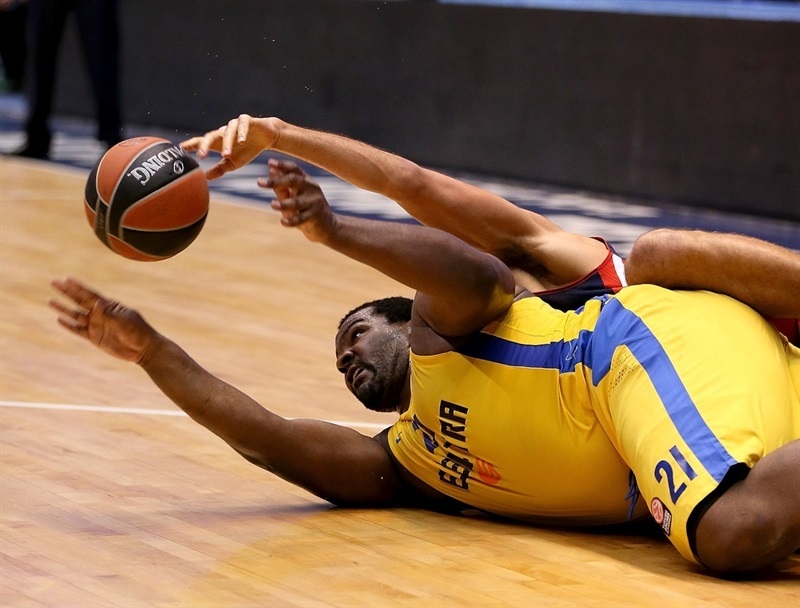 Maccabi Electra Tel Aviv got back on track by taking a thrilling 66-64 win over FC Bayern Munich on Thursday night at Nokia Arena. The win kept Maccabi in joint-lead of Group F along with Real Madrid at 5-1 record. A 15-0 run for Maccabi bridged the last two quarters to take a 60-50 advantage early in the last quarter after Munich had held a slim margin for much of the game. After an amazing Sylven Landesberg slam in a thrilling finale, three consecutive baskets from downtown by the German side brought them within 66-64, but Nihad Djedovic missed a shot to send the game to overtime with 1.6 seconds left. Ricky Hickman tallied 14 points with 7 rebounds and 4 assist for the winners, Davi Blu added 14 others, Devin Smith contributed with 12 and 8 boards while Landesberg scored 7 of his 11 in the final quarter. 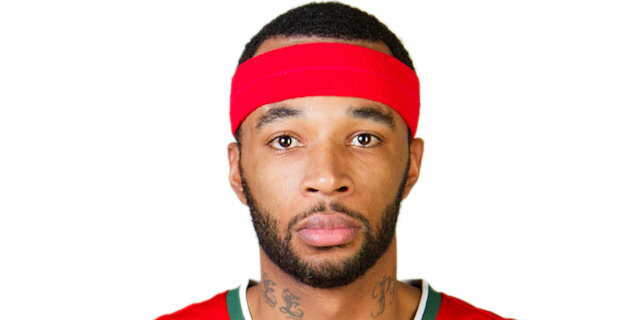 Djedovic posted 14 points for FC Bayern Munich, Malcolm Delaney tallied 13 points with 5 rebounds and 5 assists and Robin Benzing scored 11. Bryce Taylor’s two-handed fastbreak dunk opened the scoring. 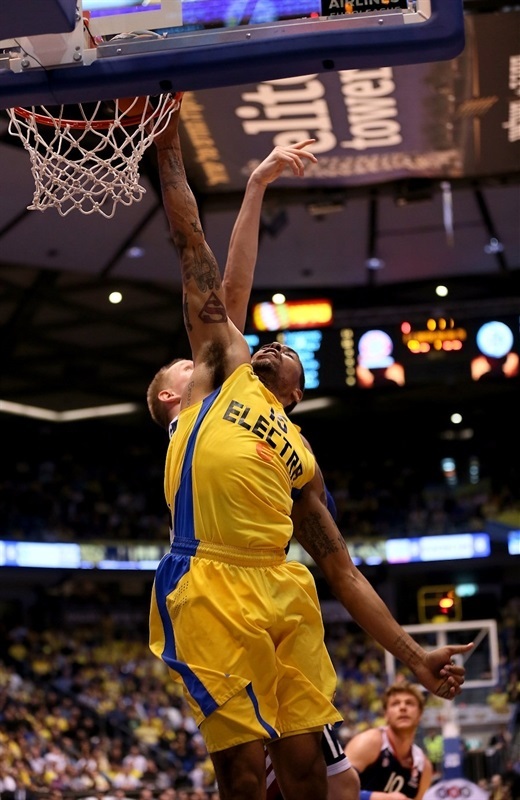 Yogev Ohayon fed Sofoklis Schortsanitis for a slam and Maccabi’s first points. Drives by Djedovic and Taylor put the visitors in control 2-6. 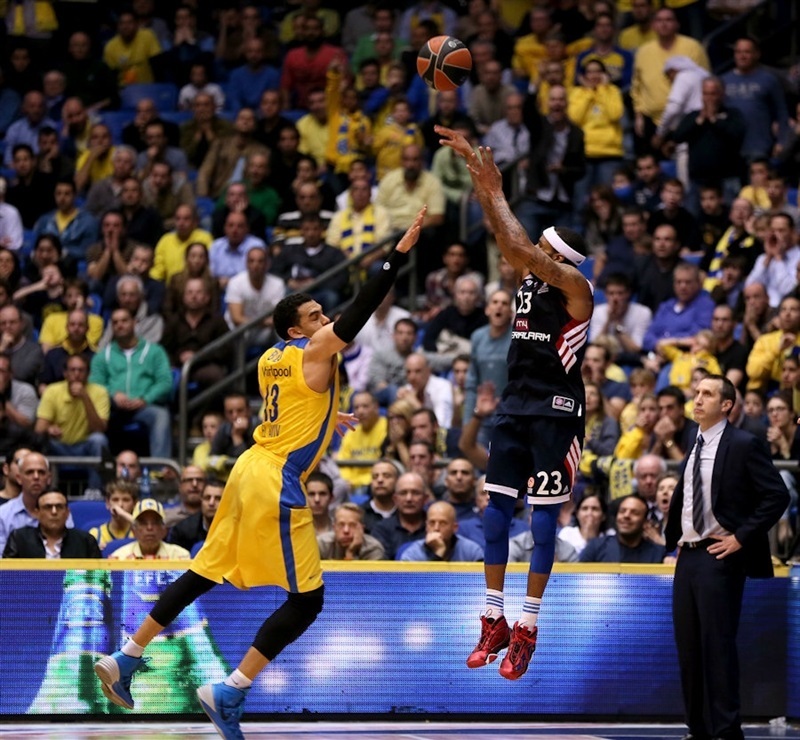 Devin Smith knocked down a three for Maccabi, but Delaney and John Bryant sank jumpers for a 5-point lead. Blu drained a long jumper only to see Djedovic counter with a three to make it 7-13. Another long jumper by Blu was met by Delaney’s first three. 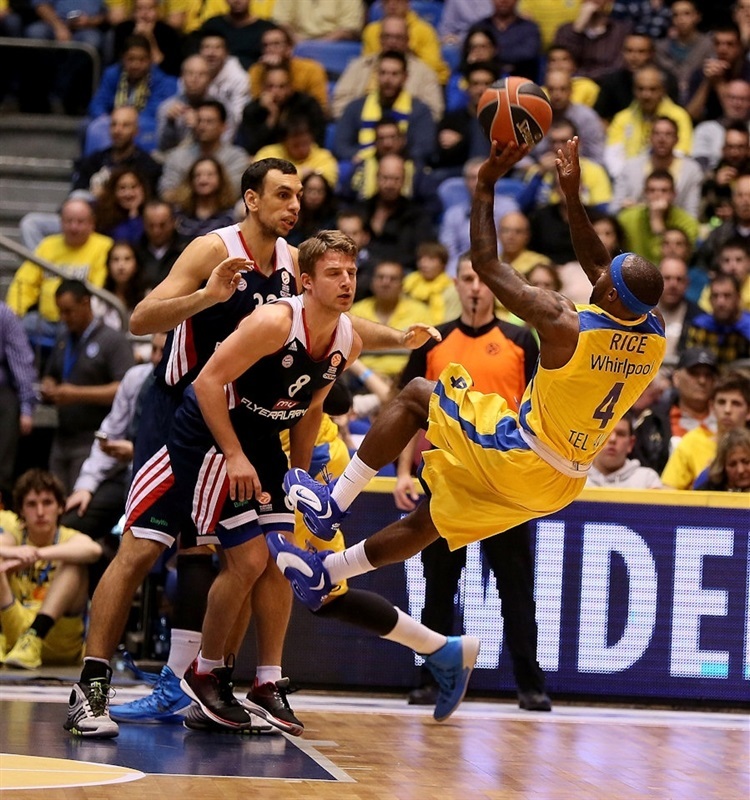 Hickman swished a mid-range shot and then sank a deep three to revive the Maccabi fans at 14-16. Blu tied the game with a baseline jumper. After the TV timeout, Delaney returned from a short rest to sink a three-pointer. Schortsanitis tied the game with a baby hook, 19-19. 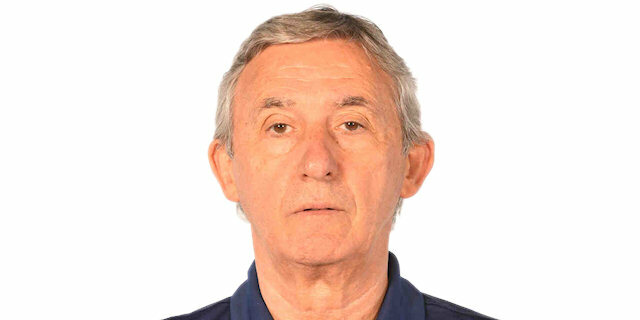 Bryant scored down low, but Blu fired in a three from the corner – the 250th triple of his Euroleague career – to give Maccabi its first lead, 22-21, at the end of the quarter. 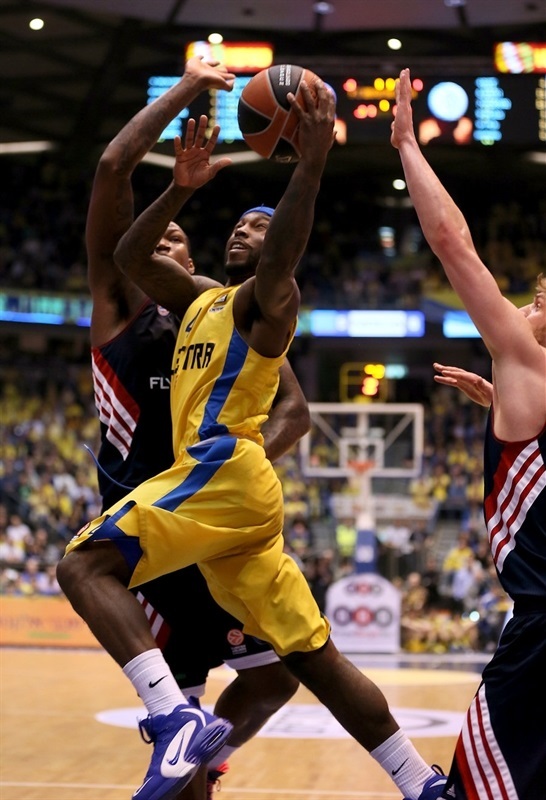 Djedovic and Bryant came together to put Bayern back on top. Blu picked up a loose ball and drained a jumper, but soon a Deon Thompson tip in left the visitors in front 24-29. 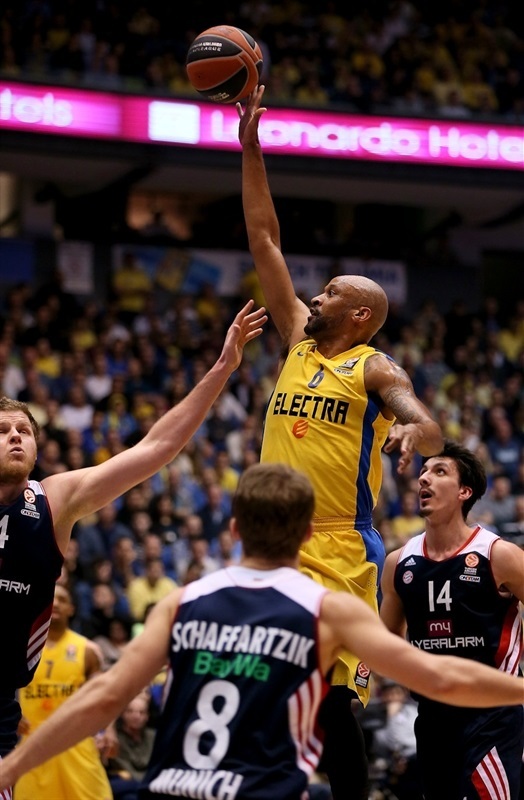 Hickman responded for Maccabi. Blu missed his first 2 shots of the night, but Hickman placed a perfect bounce pass to Ohayon in transition for a basket-plus foul to close the gap to 29-30. Hickman’s next basket gave the hosts the lead again. After a timeout, Djedovic sank a three and Schortsanitis picked up his second foul on the offensive end. Djedovic fed Thompson for a fast break layup. Tyrese Rice drove for a tough layup, Delaney matched him with free throws. Blu’s second triple tied the game at 37-37. Rice added a floater, but Benzing free throws left the sides knotted at the break, 39-39. 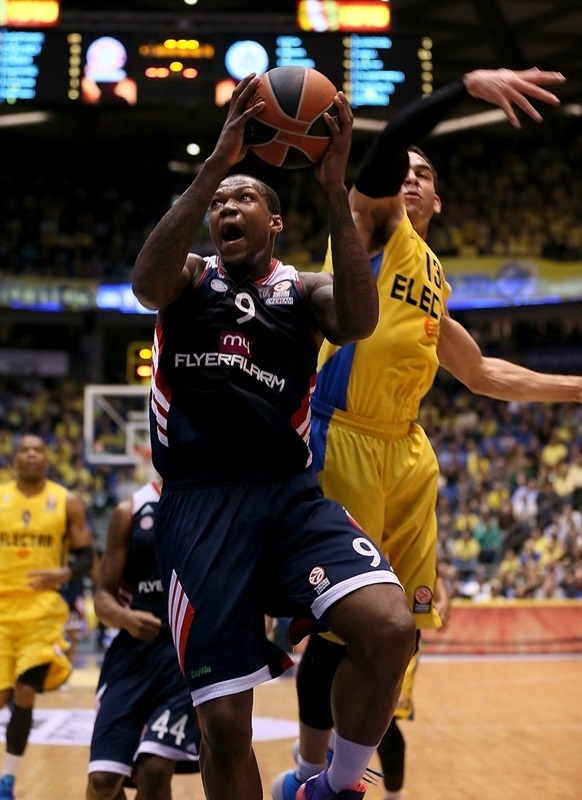 Benzing and Djedovic pushed Bayern ahead 39-43, but Smith answered with a big dunk. Djedovic and Smith exchanged baskets before Heiko Schaffartzik from mid range fueled the guests to a 43-47 lead. For a few minutes defense prevailed, Schaffartzik scored just one of his free throws, while Smith and Sylven Landesberg hit two-pointers to bring Maccabi within 47-48. Benzing was perfect at the free throw line as Landesberg scored again, before Joe Ingles with a three put Maccabi up 52-50 with a second left. Maccabi defense stopped the Munich offense, while Hickman and Landesberg scored 5 free throws and Smith with a triple capped a 10-0 run for a 60-50 margin. Lucca Staiger stopped five scoreless minutes with a three for the visitors, before Benzing’s slam. Landesberg finished his one-on-one attack with a huge dunk, and also added a free throw for a 65-55 cushion. Benzing answered with three from the top of the key, keeping his side alive, and after a time out Maccabi switched to zone defense. However Steiger again scored a deep three-pointer to make it 65-61. Delaney from the corner broight Bayern to within 2 points with 85 seconds left after a free throw from Hickman. Thompson blocked a layup from Rice, but Delaney missed the potential shot from beyond the arc to take the lead and with 1.6 seconds Djedovic missed a jumper that would have tied the game. "This was one of the toughest games I have ever coached and one of our most important wins of the season. We were forced to make many adjustments during the game to win and I'm very happy we managed to do so, because the game could have well ended differently. We were exhausted at the end and I was very happy to hear the final buzzer. " 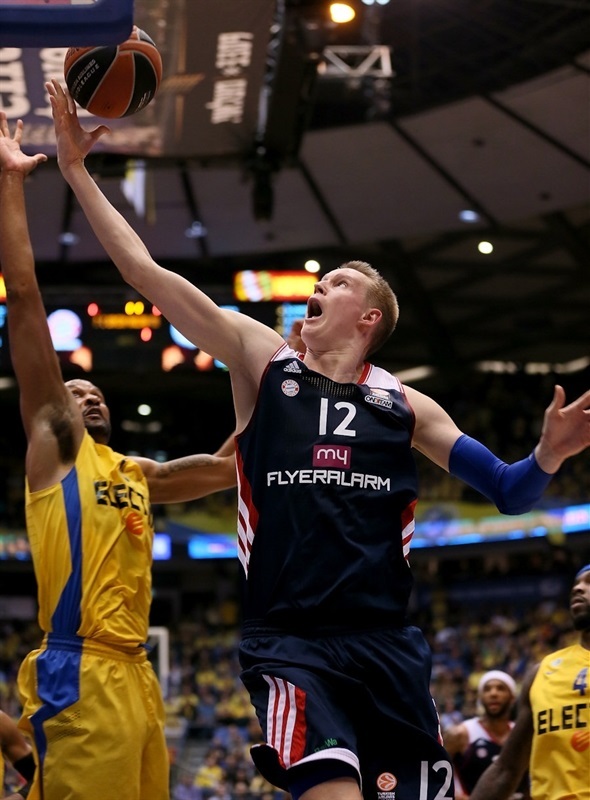 "I knew that we will play with confidence and Maccabi didn’t find a solution to our defense. We had a very good chance to beat Maccabi at home and not everyone has this chance. Nevertheless, I like the way we played tonight. We had a good opportunity to tie the game. 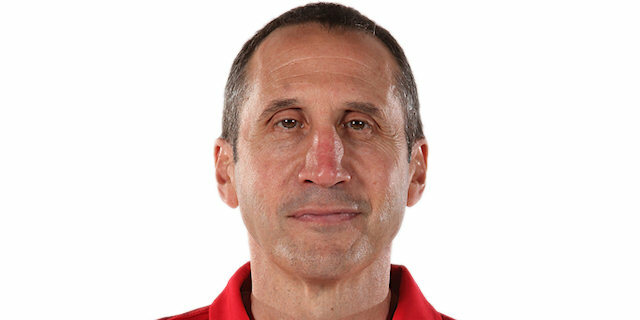 To us it is very positive the way we played tonight." "It wasn't an easy game. It was tough until the end. We really had to fight hard. Bayern is an excellent team. We knew they are very talented and deep. 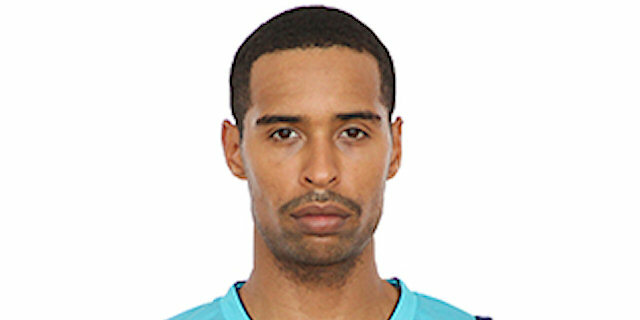 On a team like Maccabi you never know when you will get called on, so when you get your chance you have to make the most of it." "The difference between the teams was that we just couldn't get that last shot to go. We fought back into the game, but it wasn't enough. This was a game we could have won. We are playing better in our last couple of games and we can still turn it around."